Dawn Crandall is a graduate of Taylor University with a degree in Christian Education, and a former bookseller at Barnes & Noble. She is represented by Joyce Hart of Hartline Literary and is a member of Romance Writers of America, American Christian Fiction Writers, secretary for the Indiana ACFW Chapter (Hoosier Ink), and associate member of the Great Lakes ACFW Chapter. The Everstone Chronicles is Dawn's first series with Whitaker House. They were originally released as eBooks, but will all be released in paperback Fall 2015. 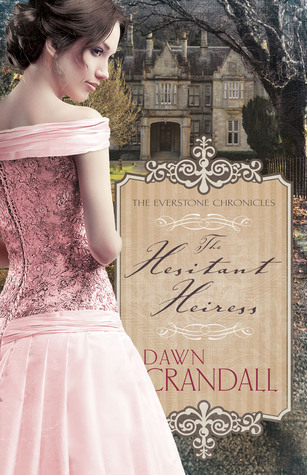 Dawn's debut novel,The Hesitant Heiress, is the winner of the 2015 Birmingham RWA Gayle Wilson Award of Excellence for the inspirational category, the winner of the 2015 Wisconsin RWA Write Touch Readers' Award for the Inspirational category and is currently a finalist in the 2015 Carol Awards--ACFW's recognition for the best Christian fiction published by traditional publishing houses in the previous calendar year. Dawn's second novel, The Bound Heart is the winner of the 2015 Clash of the Titles Laurel Award. All three books composing the series were semifinalists in ACFW's Genesis Writing Contest for unpublished manuscripts, the third book going on to become a finalist in 2013. A review e-copy of this novel was previously won in a giveaway from the author, Dawn Crandall. I love books with twists and turns. It sounds like a good one. Thanks for the review and giveaway. Have a nice day.